Beautiful, Beautiful, Beautiful, Beautiful, Beautiful Boy! 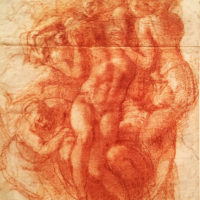 Today the artist scratches his head to conjure complex narratives while others are obsessed with staying relevant by whipping the poster child of propaganda until foaming in the mouth…with Michelangelo the narrative seemed effortless and authentic, all judgment set aside about his preference for beautiful young boys. He was a draftsman and architect as well as city planner. Some of his works were converted into objects such as jewelry and collectibles. One of the first things that leaps out at you is just how meticulous and prolific he was with his drawings and how relentless was his pursuit for perfection! 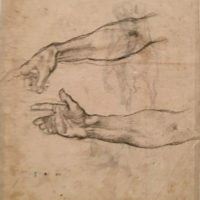 He would sketch a single arm from three different perspectives just to catch the smoothness of the skin while also preserving the definition of the muscles. 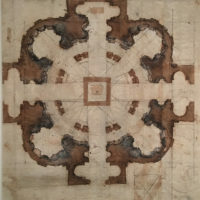 Michelangelo’s design for the plan or San Giovanni de Fiorentini commissioned by Cosimo l de Medici, Duke of Florence, had a circular plan enclosed in a square with ambulatory diagonal chapels, and entrance vestibules – never conceived before him! 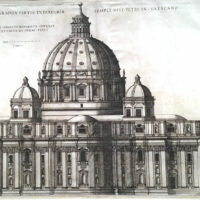 His free hand architectural renditions drawn to scale with every little detail as also his utilization of every square inch of a single sheet of paper, both front and back, are reflections of times when resources were scarce and a thing of beauty was contemplated and created with much care and time. 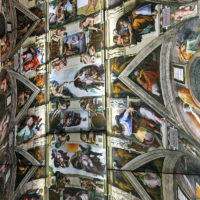 Michelangelo was commissioned by the military to fortify the walls of the Vatican. Apart from his role as an artist and architect, he was also structural engineer, not to mention a poet. He wrote many spiritual poetry in his later life. It is easy to be in awe of his versatile and prolific expression. 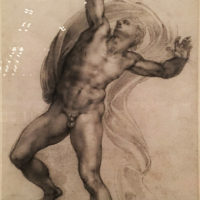 What one can’t help but wonder is if indeed a degree of difficulty might be a contributing factor to the excellence in the making of an object of art! 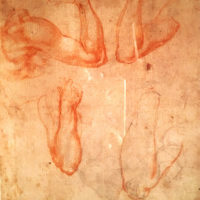 If in fact, mechanical reproduction might be the cause of death of art as we have come to collectively perceive?